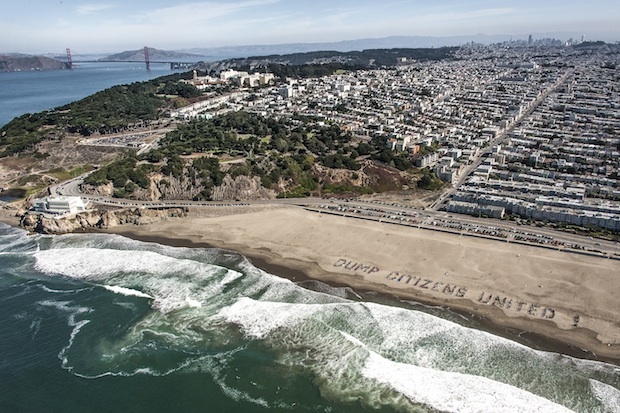 On Saturday, more than 1,000 people lay down on a San Francisco beach to create a human protest sign against Citizens United. Local cab driver Brad Newsham organized the event along with a host of activist groups, including Move to Amend and Public Citizen (both of which also support Ben & Jerry’s cofounder Ben Cohen’s effort to stamp money out of politics). Protesters also came out in support of Proposition G, which would make it official city policy to recognize that corporations aren’t people. $13 million: The amount of money that super-PAC megadonors contributed toward expenses for the Republican National Convention in August, according to a report filed with the FEC on Wednesday. 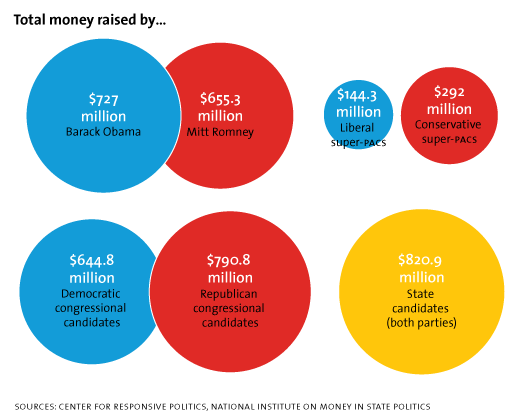 All told, more than $55 million was raised for the RNC, $32.6 million of it from corporations. The single largest donor, however, was casino magnate Sheldon Adelson, who has given at least $71 million to outside groups so far in this election. Democrats’ hands weren’t clean, either: $24 million was raised for the DNC (plus another $18 million from taxpayers) despite an earlier pledge to steer clear of corporate cash. • Democrats Broke Pledge by Taking Corporate Convention Cash: The DNC vowed to hold the first convention in history that wasn’t fueled by cash from corporations, lobbyists, and PACs. So much for that idea. • 6 Must-Have Apps for Political Junkies: From fact-checking to donation tracking, data-mining the horse race has never been so easy. • Following the Mystery Money Behind a Super-PAC’s Attacks on Tammy Duckworth: The Now or Never super-PAC pocketed $1.95 million from a nonprofit that won’t say who funds it. • Who’s Really Behind This Ad Scaring Seniors in Florida? : The dark-money group Defend my Dividend is more astroturf than grassroots.